This salad of cucumber and red chilli tossed in a zingy-sweet dressing takes minutes to prepare. If I had to pick my all-time favourite cookbook, Ottolenghi’s Jerusalem would be a strong contender. 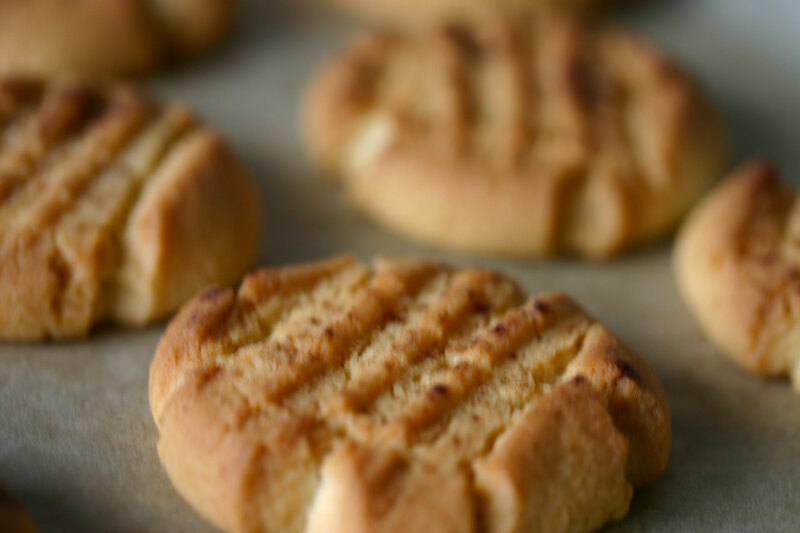 Every recipe I have made from it – and I’ve made a good number – has been a winner. And if I had to pick an all-time favourite recipe from the Jerusalem cookbook, I’d choose his recipe for roasted chicken with clementines and arak. 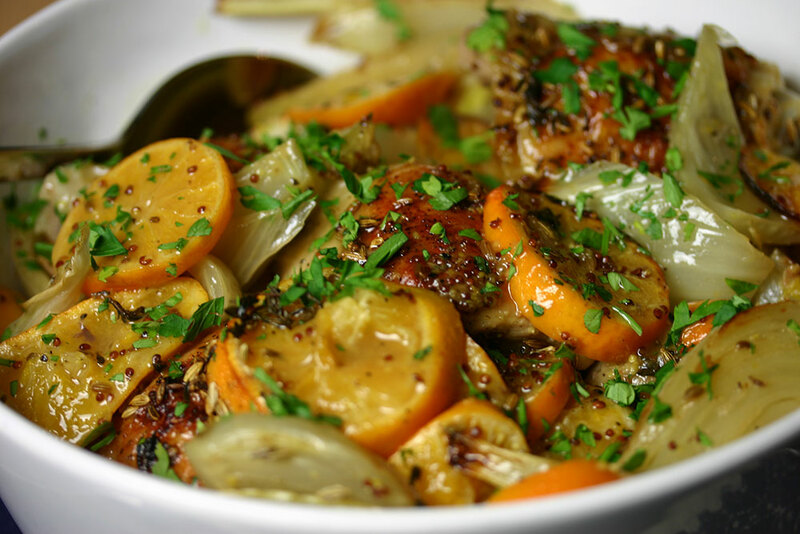 I’ve made this dish any number of times – with chicken thighs and chicken breasts; with clementines, satsumas, and once with navel oranges; with arak, ouzo or Pernod. I’ve skipped the marinating stage on occasion, and once accidently roasted the chicken for more than two hours. Nothing I’ve done has made a dent in its deliciousness. I’ve made several versions of fattoush over the years, all of which call for the bread to be toasted or fried. 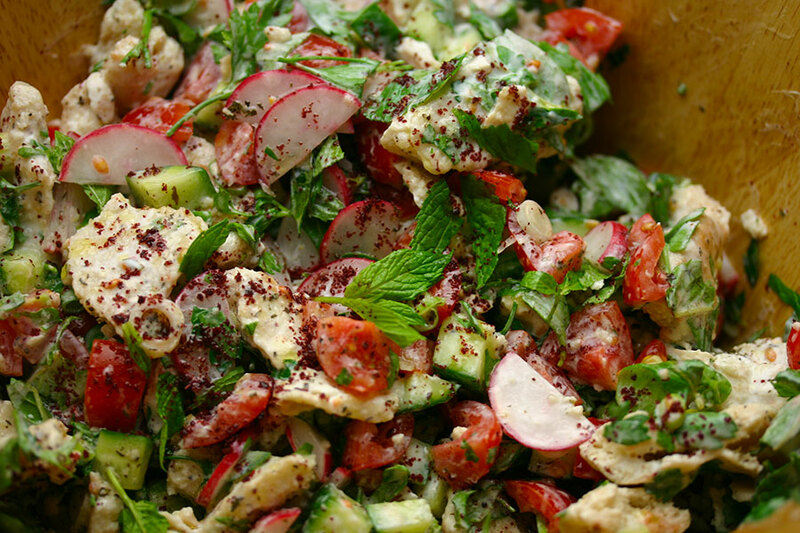 The fattoush recipe in Ottolenghi’s Jerusalem cookbook is a bit different. The bread is not cooked, for one thing. And instead of the usual olive oil and lemon juice, the salad is tossed with a yogurt-based dressing. I made this warm glass noodle and edamame salad to accompany some Vietnamese-style pork meatballs the other evening. 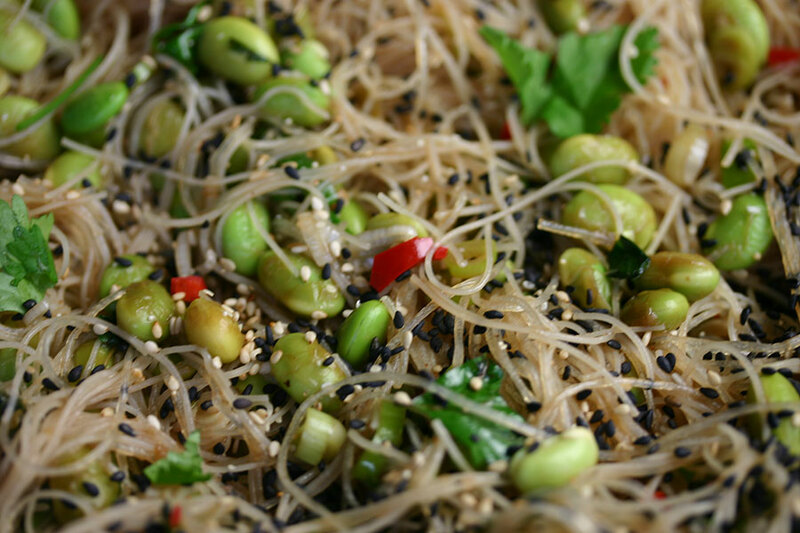 Edamame are great favourite with the kids – though what they like is best is eating them from the pods. Like most schools these days, ours is a “nut-free zone”. While peanuts are their main concern, they have banned all nuts to be on the safe side. This has led to considerable confusion about what counts as a nut – are coconuts allowed? Pine nuts? Sunflower seeds? Strictly speaking they are all seeds – peanuts, almonds, coconuts, sesame seeds, the lot… And which seeds are considered nuts depends on whether you ask a cook or a botanist. I’ve looked at this Ottolenghi recipe for chargrilled broccoli with garlic and chilli a number of times, but have never summoned up the enthusiasm to grill individual broccoli florets before today. 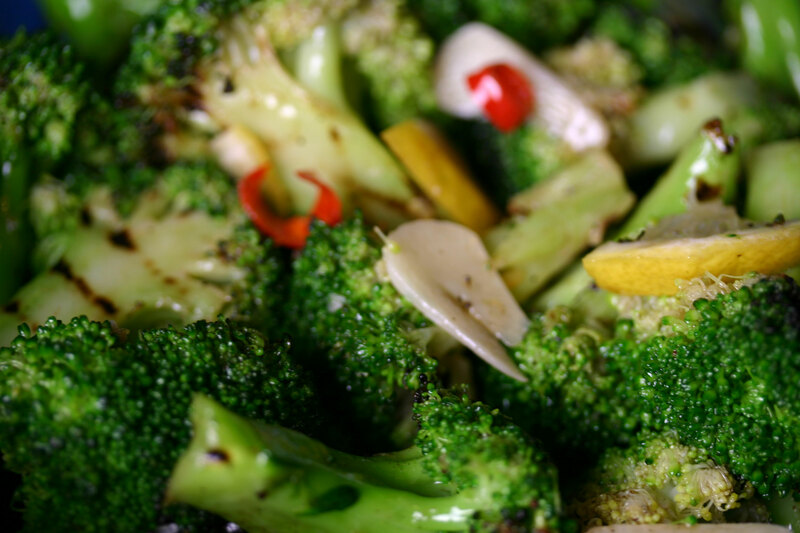 Blanching, chilling, drying, grilling – it seemed a lot of trouble for a bowl of broccoli. This spinach, date and almond salad from Yotam Ottolenghi’s Jerusalem cookbook was all over the food blogs a couple of years ago. 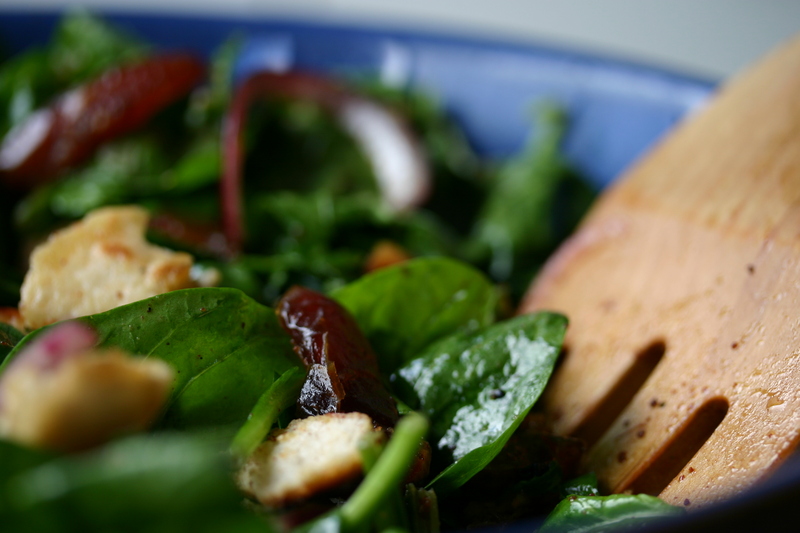 With good reason – it’s a stunner of a salad, and relatively straightforward to prepare.